The Law Enforcement Division has 3 command areas for patrol activity. Sheriff’s Substations: The following substations are staffed during limited business hours. Please call our switchboard to make sure personnel are available to assist you. Available for fingerprinting, county dog license, copies of reports, information, etc. Main entrance in front building opposite of Main St.
*** All remaining sub-stations in Yavapai County are not staffed. 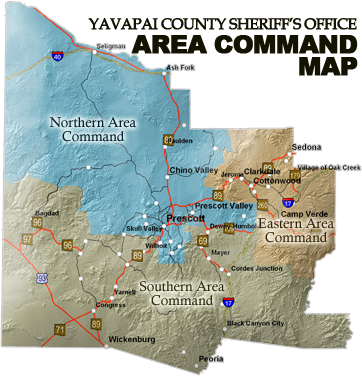 These offices located in Ash Fork, Black Canyon City, Dewey-Humboldt, Seligman, and Yarnell are used by deputies to write reports, process evidence, etc.